With an unmatched fluency in twang and a loopy sense of humor...master guitar picker Redd Volkaert! 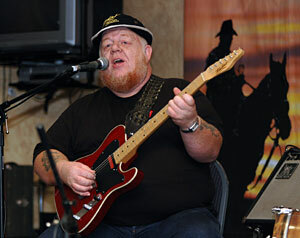 After years of developing a cult reputation among guitarists, Volkaert got the call to become lead guitarist for one of his heroes, Merle Haggard, in 1997. Since then he has been a 'Stranger' in Merle's band, recording and touring non-stop, and appearing in concert and national television before millions of people. As a youngster in Vancouver, British Columbia, Volkaert learned to play guitar from his dad. By the time he was 16 he was playing in local bars and clubs in Vancouver. After an 8-year stint in Alberta he left the great north woods for Los Angeles, playing clubs, teaching guitar, and working on demo sessions. Moving to Nashville in 1990, he began doing studio session work and road dates with artists like Ray Price, Lacy J. Dalton, Clinton Gregory, and Dale Watson, eventually winding up in Merle Haggard's band, The Strangers. Since Redd moved to Austin, Texas, he has become a major participant in its thriving live-music scene. Tomkins Guitar Clinic, Tamworth 2006.